Writing and receiving letters is fun! In 1860, Grace Bedell wrote a letter to Abraham Lincoln and took it to her local post office to mail it. A week later, a very special letter was waiting for her when she returned. 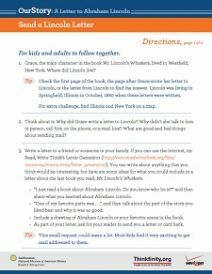 In this resource, children will write a letter and then take it to the post office using helpful advice. 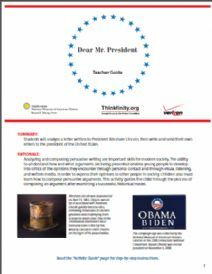 Included in an OurStory module, entitled A Letter to Abraham Lincoln, this activity will encourage children to write letters to friends and family as well as learn more about their local post office. OurStory is a series of modules designed to help children and adults enjoy exploring history together through the use of objects from the Museum's vast collections, quality children's literature, and engaging hands-on activities. 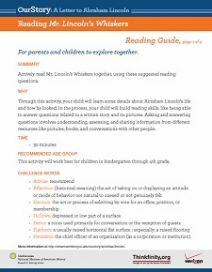 Ideal for afterschool use, OurStory resources will allow students to think critically, to be creative, and to achieve academic standards both in and out of the classroom. 8C: The student understands changes in communication and their effects.